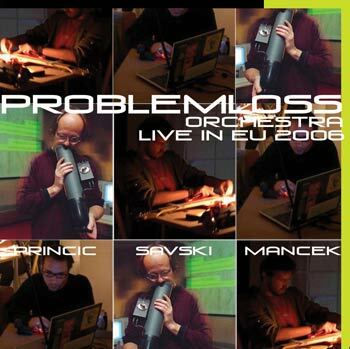 Problemloss Orchestra (PMS; Prinčič, Manček, Savski) dealt with the interweaving of sound identities/entities into a sound stream - the sound drama, that always emerges, when something is put onto the timeline. We did not preoccupate ourselves with details of dramatic content - except during the performences. Therefore: live improvisation. The point was discriminating the real-time (a live performence) and the constructed time - the time of preparation (the composition, the building). The latter exists, of course, but in a different way. We approach the composition in different ways: by building sound interfaces. These can be mechanic, electronic, electric (mechatronic), computer - and all present their own identity (a kind of dynamic inertia, or: their own algoritmic structure). All comes together in an abstract layer called sound, where every one of the performers only vaguely directs his own "alienated representations" (=sounds). Alienated in the sense of relative remoteness of the musical input - the "playing". This method allows for a remote (and more credible) view on the time passing by - the dramaturgy.